Boris Paichadze Dinamo Arena or Boris Paichadze National Stadium as it was previously known is the national sports stadium of Georgia. Used to predominantly host football fixtures including those of local side Dinamo Tbilisi, the 55,000 capacity venue also hosts rugby matches. Originally Dinamo Stadium opened in 1936 and was large enough to accommodate 23,000 supporters. Led by Georgian architect Gia Kurdiani, the ground was completely redesigned and rebuilt in 1976 – exactly 30 years after first opening. The inaugural fixture was played on 29th September 1976 between Dinamo Tbilisi, the most successful Georgian club side of all time and Cardiff City from Wales. The home side christened their new stadium with a convincing 3-0 victory. 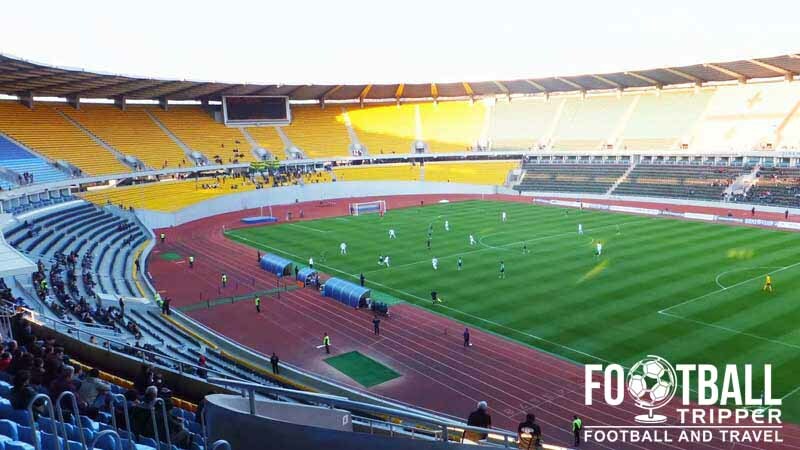 Used by the USSR National football team and by Spartak Moscow and Dynamo Kiev for their autumn European fixtures, the ground then known as Lenin Dinamo Stadium began to rise in prominence as one of the leading football ground’s in Eastern Europe. Home to the Georgian National Football team since 1990 when the country declared independence from the Soviet Union, the record International attendance was set in 1995. The fixture saw Germany defeat Georgia 2-nil in a qualification match for Euro 1996. Unlikely to ever be beaten, Boris Paichadze was converted to all-seating in the Summer of 2006 and today’s only sits at 54,549. The ground was was renamed in honour of Boris Paichadze (one of Georgia’s most iconic footballers) between 1995 and 2011, and is currently known as “Boris Paichadze Dinamo Arena”. Dinamo Arena is one continuous bowl which can be broken down into four sections: North, East, South and West. 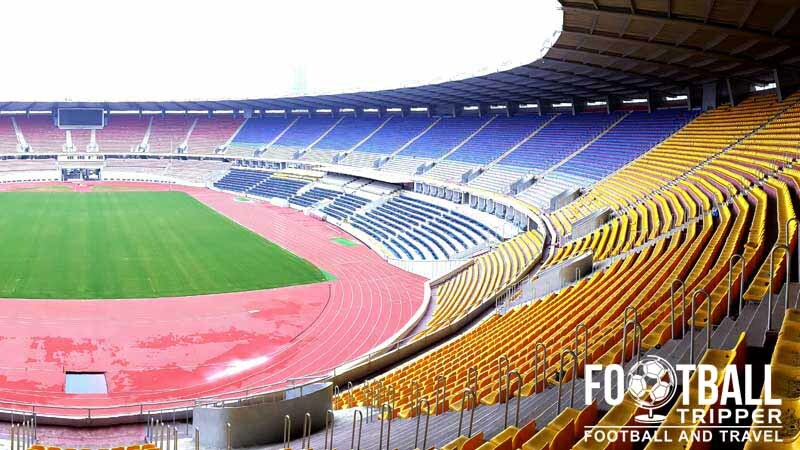 Dinamo Arena is on par with many other national stadiums which emerged from the 20th Century such as Rome’s Stadio Olimpico and Moscow’s Luzhniki, and subsequently does feel a little rough around the edges. One of the most famous European nights came during the 1979/1980 season when Dinamo Tbilisi overturned a 2-1 defect to dump Liverpool out of the European Cup – a world class team who would subsequently go onto win the competition the following season. 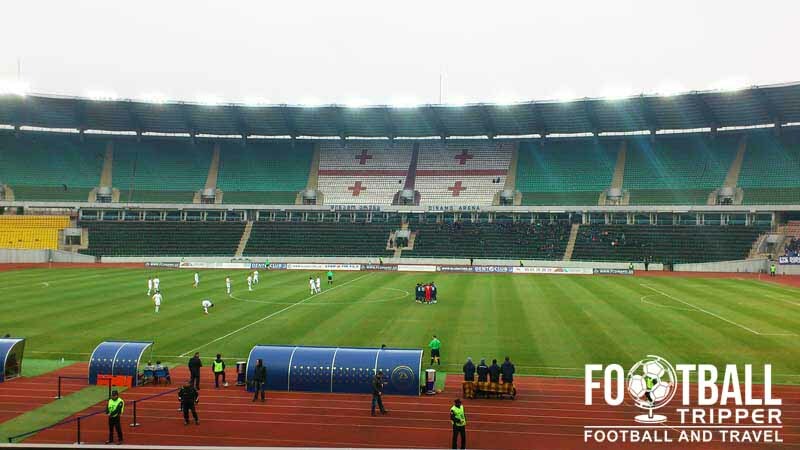 Played out in front of 90,000 screaming fans, these types of legendary games and atmospheres may be impossible to replicate these days but the stadium certainly isn’t to blame for the decline of Georgian football. Dinamo Tbilisi fans inside Boris Paichadze Dinamo Arena. The club’s main nickname is just the Blue-Whites for obvious reasons. The national team of Georgia plays in white and red. Away fans are usually housed within the south-west corner of the stadium within blocks 3-4 of the red coloured stand. Set across two-tiers which take up around 1/7th of the south stand, the standard away ticket allocation is upwards of 2,000 per match. The area around the stadium does feel slightly run down and there isn’t really an obvious nucleus of night-life and bars. If you peel off down a few side streets you’re likely to find a local cafe where you can get a beer from. There’s no official stadium shop like at Wembley and the majority of national stadiums. Instead you will find a few independent retailers selling replica shirts, scarves and other typical merchandise. Not all of it official! It doesn’t appear as if there’s currently a stadium tour available of Boris Paichadze Dinamo Arena perhaps due to the facilities being slightly dated compared to some grounds in Western Europe. If the situation changes regarding the tour we’ll be sure to update this section. 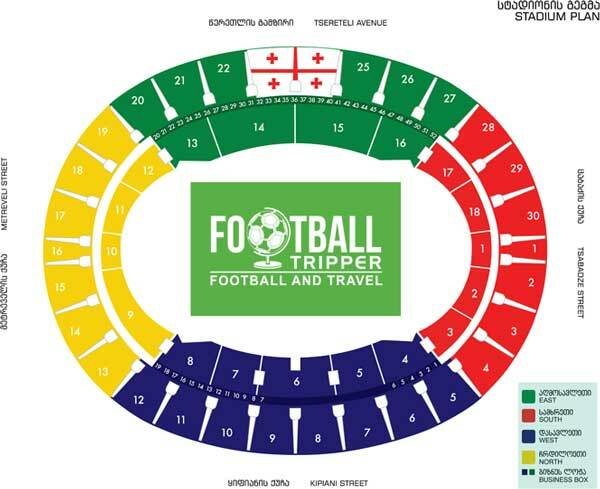 Tickets to see your country take on Georgia in an international fixture should be acquired through your national football association – as is the case for most FIFA and UEFA sanctioned matches. TIckets to see Dinamo Blisi in action can either be purchased from their official website (non-English), or in person from the ticket office at the stadium. You can either do this in advance of the match or just before kick-off as stadium’s large capacity is very rarely full for domestic fixtures. Expect to pay peanuts for a ticket with premium tickets costing 20 GEL which equates to around just over €8.00. 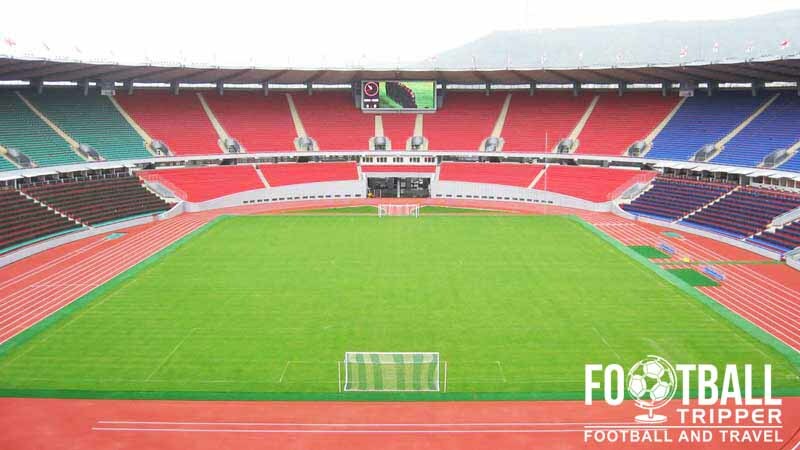 Boris Paichadze Dinamo Arena is located bang in the middle of Tbilisi city centre, and in terms of location you probably couldn’t ask for a better ground. If you’re of the opinion that today’s out of town footballing arenas lack soul then you’re in luck with Georgia’s national stadium. From the ground level Georgia’s national stadium definitely has that spaceship feel due to its circular design and exposed support beams which are immaculately spaced. Dinamo Arena/National Stadium : 11, 15, 20, 21, 27, 33, 46, 84 and 86. The nearest bus stop is located south-east of the ground on Akaki Tsereteli Avenue. Tbilisi Central Station is connected to the adjacent shopping centre, and is located one block or 850 metres from Dinamo Arena. The city is served by its own metro system which dates back to 1966, and features 22 stations across two lines. The two closest stops are Station Square 1 on the Akhmeteli–Varketili Line which is red, or Station Square 2 which is on the Saburtalo Line which is green. Unless you’re travelling from outside the inner city then you probably wont need to travel on the metro specifically to get to the stadium. The main railway station is connected to both metro lines which makes it ideal for travelling around the city. Surrounded by a dense urban area street parking within the surrounding roads doesn’t appear to be a possibility. Try the central station and the adjacent shopping mall but be prepared to park further away than you would like. Tbilisi International airport sits 17 km south-east of the historic city centre, and since the new terminal opened in 2007 more and more European airlines are offering flights to Georgia than ever before. Upon landing you can travel into the city centre by the number 37 bus which will take you to the main train station in around 50 minutes. The two closest hotels to Dinamo Arena are Hotel Tbilisi Central by Mgzavrebi and Astoria Hotel. There appears to be more choices south-west of the ground, across the river Mtkvari. Here you will find the Hotel Iliania, a Radisson Blu and City Partner Hotel Primavera.